Despite the financial crisis and continuing austerity in many European countries, the demand for luxury homes in Spain continues to grow. Luxury homes (those over one million Euros) have seen a 78.8% increase in viewings since 2013, Spain’s “annus horribilis”. In August 2015 the number of searches for property over one million Euros on property portal idealista accounted for 3.6% of all searches. This year that has risen to 4.2%. When looking at the supply of this type of property there has been an increase in the number of million euro properties. In 2013 this type of home made up 2.3% of properties in Spain. Today that percentage has risen to 2.7%. The price has also increased with the average price of a luxury home in Spain standing at 1,982,939 euros, 6% higher than in 2013. 75% of properties over one million euros can be found in Madrid, Barcelona, Malaga and the Balearic Islands. 87% of those properties have more than 4 bedrooms. 65% are between 200m² and 600m². The most common size is between 200m² and 400m². Only one in ten luxury homes are larger than 900m². 60% of homes over one million euros have a swimming pool. In Sotogrande (Cádiz) 92.1% of luxury homes have a swimming pool. 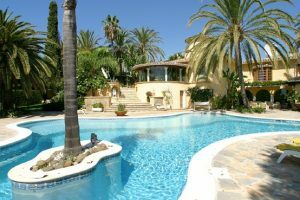 Other areas where you are almost assured of finding a pool include two towns in Marbella: Los Monteros where 89.8% of luxury properties have a pool, and Sierra Blanca where 80% have a pool. You are most likely to find a luxury property without a pool in city centres. For example, in Valencia Pla del Remei only 1% have a swimming pool. In the Salamanca district of Madrid that figure is higher at 6.9% but still way below the coastal areas. The price of luxury homes differs depending on the location of the property. Coastal markets with an international reputation are the areas where prices have increased the most. Sotogrande, for example, has seen luxury property prices increase 34.9% since 2013. Sierra Blanca (Marbella) has seen the cost of a luxury property increase by 21.8%. In Los Monteros (Marbella) the increase is 18.2%. In Palma de Mallorca however, prices have remained relatively stable over the last three years with prices being 0.3% less than three years ago. The Salamanca district of Madrid is similar with prices having risen only 2.3%. In Madrid there are four developments with a high density of luxury properties: In La Moraleja 97% of homes for sale have a price of more than one million euros. La Villa has 96.6% over one million. Montealina has 89.6%, and El Viso has 73.8%. On the Costa del Sol there is a famous development named La Zagaleta. Although there are not too many properties in this exclusive area, 100% of them are worth more than 1,000,000 Euros.